Ideal for keeping your dog warm, make your pet become more attractive, energetic and dynamic in crowd. 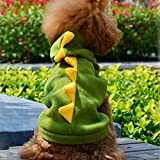 Your pet can be more cute in a dinasaur design clothes. 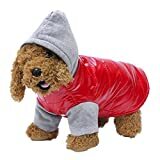 Stylish and warm, not too puffy, make your puppy charming in cold days. Fleece lined for great warmth. Recommend for Small puppy, Chihuahua, Dachshund, Miniature Schnauzer Terrier, Poodle, Pom, Pekingese, English Cocker Spaniel, Bichon Frise, Pug, West Highland White Terrier, Welsh Corgi Pembroke, Chrysanthemum, Miniature Pinscher, Basset Hound, French Bulldog, etc. 1.Different designers use their own size charts. Please check the detailed Size descriptions to order. 2.Back Length do note include tail length. 3.Take measurement a bit loosely, so there will be room for your dog to move and breathe.